The 26th annual Holiday Stroll delivers Santa Claus on Friday night and offers a menu of events through Saturday. 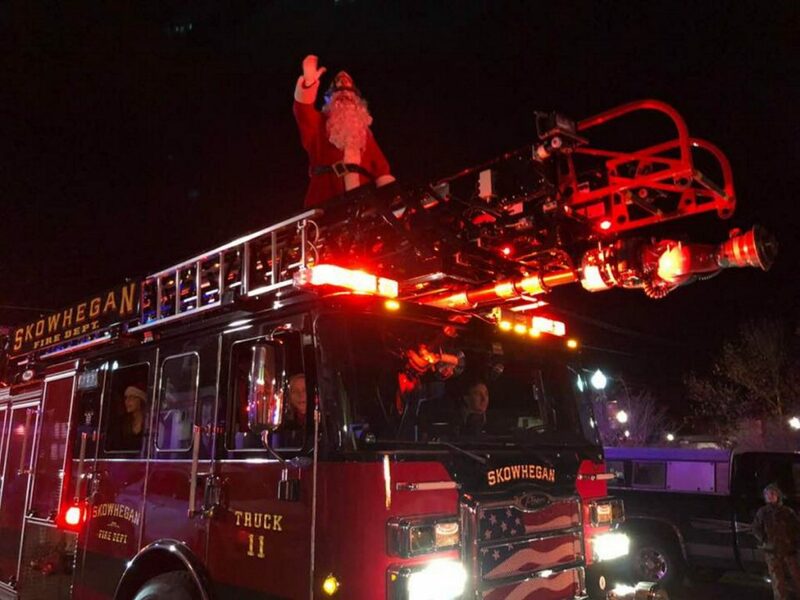 SKOWHEGAN — How about some nice hot cocoa, a free Christmas movie, an elf-on-a-shelf scavenger hunt, an ugly sweater walk and a big parade through downtown Skowhegan featuring Santa riding high on a firetruck? Well, you’re in luck, because the 26th annual Holiday Stroll gets underway Friday morning and will run through Saturday, with horse-drawn wagon rides, a bonfire for roasting marshmallows, crafts and vendors and Santa’s personal mailbox for Christmas wishes. Gingerbread competition: Skowhegan Savings Bank 9 a.m. to 3 p.m.
Pancake breakfast: Christ Community church 8 to 10 a.m. Craft fair: Maplecrest Living Center 9 a.m. to 2 p.m. Craft fair: One Madison Avenue 9 a.m. to 2 p.m. Horse and Wagon rides: Town Office 11 a.m. to 2 p.m.
Cookie decorating: Apple Tree Bakery 12 noon to 4 p.m.
Crafts and cocoa: Taylor’s Drug Store 11 a.m. to 1 p.m.
Cocoa to go: Bangor Savings Bank 2 to 5 p.m.
Over the River Ringers: Bell concert St. Sebastian Church 3 p.m.
Fireworks by the river: Best viewing Renys parking lot 5:15 p.m.
Christmas parade: Main Street 6 p.m.
Santa visit: Madison Public Library 7 p.m. after the parade. Lessons and carols: Junior High Auditorium 4 p.m.
“The Holiday Stroll is such a great event that really brings together our community to celebrate the joys of the season,” said Kristina Cannon, executive director of host Main Street Skowhegan. “We regularly have more than 30 floats in the Friday night parade. Dozens of businesses and organizations participate in the festivities throughout the weekend, and they really go all out hosting family activities. Festivities are scheduled to begin at 9 a.m. Friday, when families can sign up for a phone call from Santa in December. Registration is scheduled for 9 a.m. to 3 p.m. Friday and Saturday at the Skowhegan Fleuriste on Water Street and at the Skowhegan Area Chamber of Commerce on Commercial Street. A holiday bazaar is scheduled for 10 a.m. to 6 p.m. Friday at the Skowhegan Free Public Library on Elm Street. The film “A Christmas Story” will be shown free at 4 p.m. Friday and again at 10:30 a.m. Saturday at the Strand Cinema on Court Street. The annual holiday parade leaves the Skowhegan Savings parking lot on Elm Street at 7 p.m. Friday and winds its way down Madison Avenue and Water Street, ending at the Redington Memorial Home. After breakfast Saturday, there will be ornament making at Tewksbury Hall with the Skowhegan Area Middle School Student Council, to be followed by craft fairs, a petting zoo and children’s activities downtown until mid-afternoon. There also will be fire hoop performances from 11 a.m. to 1 p.m. in the municipal parking lot and an ugly sweater walk at 11 a.m. from the Skowhegan Area Chamber of Commerce to the Redington Home, sponsored by the Greater Federation of Women’s Clubs. A $10 donation will help raise money to send a female veteran for a weeklong stay at the Travis Mills Foundation Veterans Retreat. Prizes will be awarded for the three ugliest sweaters. There also will be “snowman soup,” with the Skowhegan Rotary Club, from 10 a.m. to 2 p.m. Snowman soup is making your own hot cocoa mix, with kids putting any toppings — M&Ms, marshmallows, chocolate chips — in a bag and tying it with a bow. They get a candy cane to stir, Cannon said. “For us, this event is about more than just celebrating the season,” she said. “It’s also about injecting dollars into the Skowhegan economy. The goal of every event that we host is to encourage people — residents and visitors — to spend money in our locally owned businesses, if not the day of the event, then in the future. For a full line up of events, go to https://mainstreetskowhegan.org/holiday-stroll/ on the Internet.